She believes women of colour aren’t represented enough in society. She believes women of colour aren’t represented enough in society, so she’s decided to tackle the issue in an artsy and classy way. 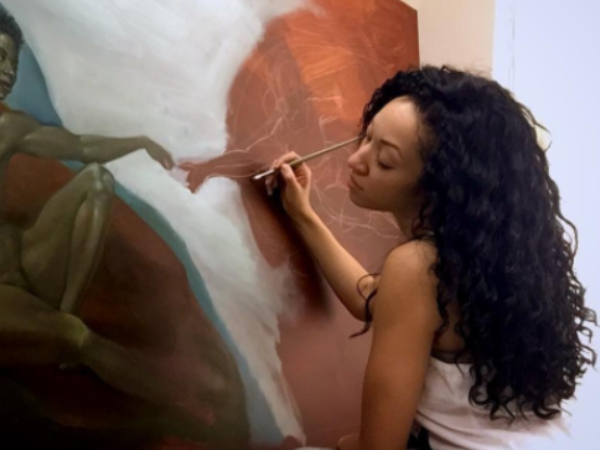 Harmonia Rosales (33), from Chicago, decided to replace famous paintings that feature white men, with black women. “I wanted to take a significant painting, a widely recognised painting that subconsciously or consciously conditions us to see white male figures as powerful and authoritative and flip the script, establish a counter-narrative,” Harmonia told BuzzFeed. In her most recent work of art, she recreates Michelangelo’s ‘The Creation of Adam’. In it, she changes, amongst others, the illustration of God and Adam as white and male, and replaces them with black women. The 33-year-old mother’s work has since gone viral, with many applauding her work and others criticising her for using someone else’s art and presenting it as her own. But Harmonia is unfazed. She’s aware that her intuition might not resonate with certain people. Besides wanting to change the perception of race and women in society, Harmonia wants to teach her daughter – and other little girls – to embrace her ethnicity. “I want my daughter to grow up proud of her curls and coils, her brown skin, and for her to identify as a woman of colour, a woman of value.